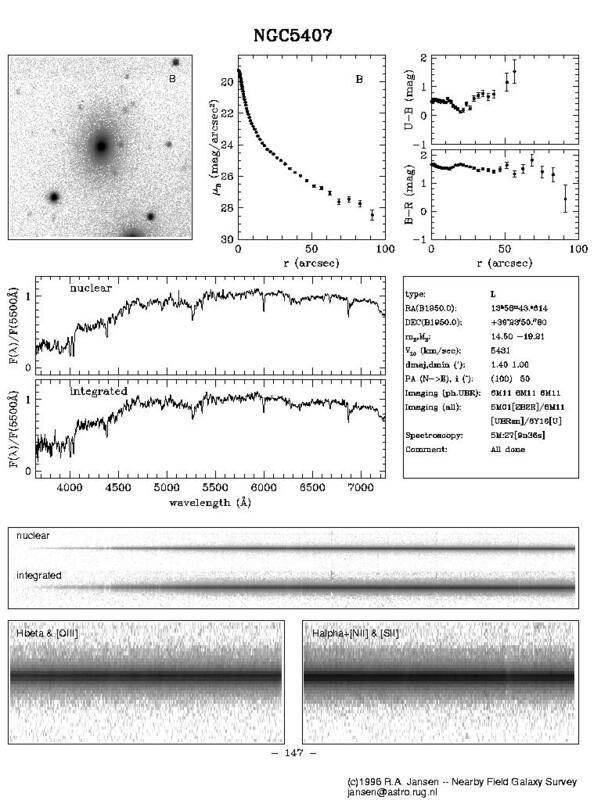 The Nearby Field Galaxy Survey (NFGS) is a collaborative effort to construct a photometric and spectrophotometric reference atlas and catalog of the observable properties of ~200 nearby field galaxies. The galaxies span a wide range in luminosity and color, and are of all morphological types. In the selection of the galaxies care was taken to avoid serious biases towards cosmic environment, surface brightness, luminosity, and color. This survey is designed to be a benchmark for interpreting the spectra and imagery of distant galaxies. The main goal of this program is to study the variation in star formation rates, star formation history, excitation, metallicity, and internal kinematics as a function of galaxy luminosity and morphological type. Our team includes Rolf Jansen, Marijn Franx, Daniel Fabricant, Sheila Kannappan, Nelson Caldwell, Lisa Kewley and Margaret Geller. Contact information is given below. The NFGS web-pages are currently hosted and maintained at the Arizona State University at http://www.public.asu.edu/~rjansen/nfgs/. The original NFGS pages at the Kapteyn Astronomical Institute (http://www.astro.rug.nl/~nfgs/) and the mirror at the Harvard-Smithsonian Center for Astrophysics (http://cfa-www.harvard.edu/~jansen/nfgs/) are no longer available. The NFGS sample: names and coordinates, as well as an overview of the available data (B images, integrated spectra, and radial profiles of UBR surface brightness and B−R and U−B color). NEW: NFGS data products: radial surface brightness profiles and spectra, and electronic versions of the tables published in several of the NFGS related papers. Information regarding the selection of the galaxy sample . Original motivation for this project. 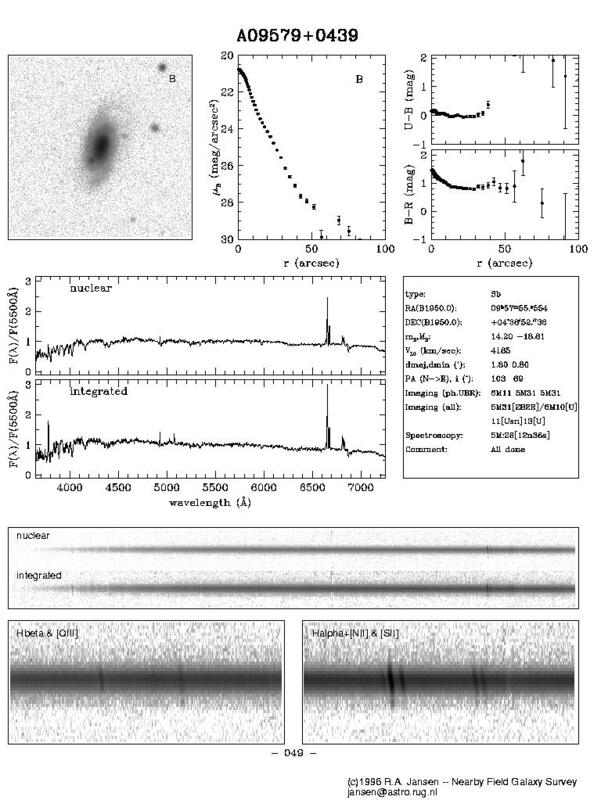 Sample pages (JPEG) of the observations made for three galaxies in the survey: A09579+0439, A11592+6237 and NGC5407. 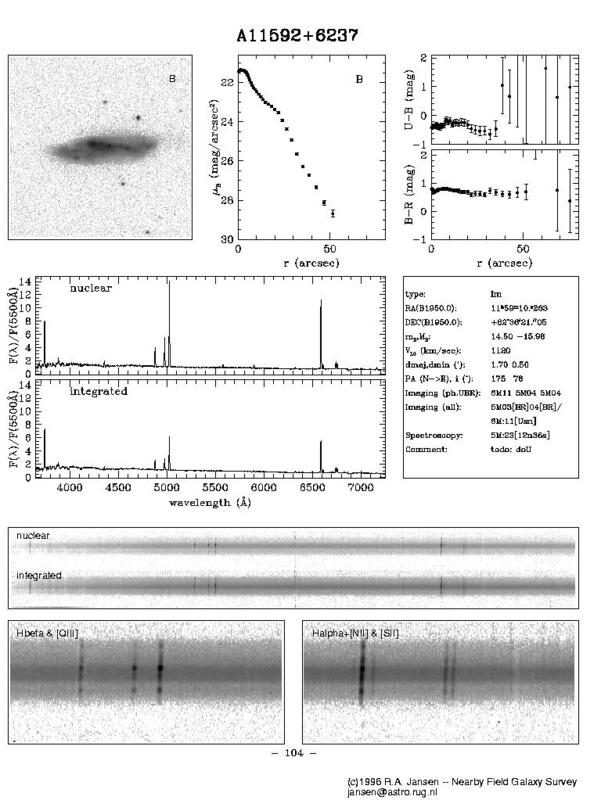 Annotated nuclear and integrated spectra of A11592+6237, a Magellanic Irregular (Im) type galaxy, with an absolute B filter magnitude of −16.4, and vigorous ongoing star formation. Posters of the atlas of images and radial profiles (PDF; 6.4 Mb) and of the atlas of images and integrated spectra (PDF; 4.8 Mb). Surf to R.A. Jansen's homepage at ASU.